BETELGEUSE (Alpha Orionis). The great star Betelgeuse is one of the two that dominate mighty Orion of northern winter, the other Rigel, the pair respectively also called Alpha and Beta Orionis. The name Betelgeuse is a corruption of the Arabic "yad al jauza," which means the "hand of al-jauza," al-jauza the ancient Arabs' "Central One," a mysterious woman. For us, it marks the upper left hand corner of the figure of the Greek's ancient hunter (and since he depicted is facing you, his right shoulder). One of the sky's two first magnitude supergiants (the other Antares), Betelgeuse is one of the larger stars that can be seen, indeed one of the larger stars to be found anywhere. Typically shining at visual magnitude 0.7 (ranking 11th in the sky), this class M (M1.5) red supergiant (with a temperature of about 3650 Kelvin) is a semi-regular variable that changes between magnitude 0.3 and 1.1 over multiple periods between roughly half a year and 6 years -- and possibly longer (and of course changing its rank). That may explain why Betelgeuse is the Alpha star even though it is generally fainter than Rigel. (On the other hand Bayer frequently also used position in lettering his stars.) The star's distance is a problem and a puzzle (true for all the other parameters as well). Direct parallax measures from space, using the most modern results, give 495 light years, whereas the parallax using the star's natural radio emission gives 640 light years. At a compromise distance of 570 light years, and allowing for a lot of infrared radiation and for absorption of light by circumstellar dust, the luminosity comes in at 85,000 times that of the Sun, considerably more than comes out of Antares. At the larger distance, luminosity boosts up to 105,000 Suns. From these and the temperature, we derive respective radii of 3.1 and 3.4 Astronomical Units, more than double the size of the Martian orbit. The star is so big that its angular diameter is easily measured. Indeed it was the first to have such a measure, of 0.047 seconds of arc, from which we find a true radius of between 4.1 (compromise distance) and 4.6 (larger distance) AU, considerably greater. However, the star is surrounded by a huge complex pattern of nested dust and gas shells, the result of aeons of mass loss, that extends nearly 20,000 AU away (Betelgeuse so far having lost over a solar mass). That, an extended atmosphere, and the pulsations make it difficult to locate an actual "surface" to tell just how large the star actually is. Moreover, because of changes in gaseous transparency, the "size" of the star depends on the color of observation. Long-wave infrared measures give a vastly larger radius of up to 5 AU and greater, as big as the orbit of Jupiter, while shorter-wave infrared light gives as small as 3 AU. Moreover still, infrared measures reveal Betelgeuse to be shrinking (by some 15 percent over about 20 years), and other measures show that the star is not even round, but somewhat oval. Hubble observation also shows hot spots. It's no wonder that we find the various disagreements. It's more surprising that all agree as well as they DO. Whatever the actual numbers, Betelgeuse is clearly a highly evolved star, one whose central hydrogen fuel supply has run out. As a result, the core has contracted into a hot dense state, and the outer portions swelled outward. We do not really know the star's condition at the moment, but the odds are that it is now in the process of fusing helium into carbon and oxygen in its core. From theory, its initial mass should have fallen somewhere around 18 or 19 times that of the Sun. Starting life as hot, blue, class O star only around 10 million years ago, Betelgeuse will fuse elements through neon, magnesium, sodium, and silicon all the way to iron. The core will then collapse, causing the star to blow up as a supernova, most likely leaving a compact neutron star about the size of a small town behind. 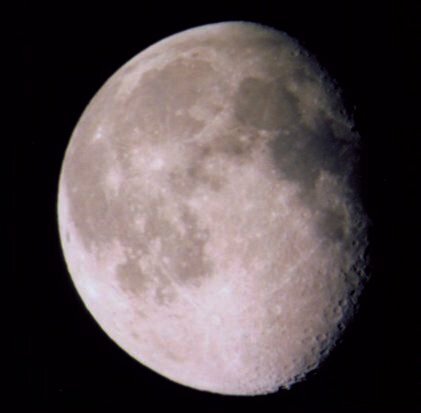 If it were to explode today, it would become as bright as a gibbous Moon, would cast strong shadows on the ground, and would be seen easily in full daylight. Birthplace was far away. The star's motion shows it to be a runaway member of the Orion OB1 association, particularly the subgroup that involves the stars up and to the right of the Belt. New observations show that Betelgeuse is producing a shock wave as it plows through an interstellar cloud at 30 km/s, double the speed of its wind. The star is also violently convective, non-spherical, and irregularly losing mass at a rate of some five hundred thousandths of a solar mass a year. Written by Jim Kaler 2/20/98. Last updated 1/25/11. Return to STARS.